The full casting details are now available for Take That's UK Tour of Tim Firth's new musical, THE BAND which kicks off at Manchester Opera House on 8 September, with a national press night on Tuesday 26 September 2017. The advance box office for the tour has now topped a record-breaking £10 million. 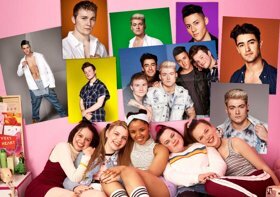 Joining the previously announced AJ Bentley, Nick Carsberg, Curtis T Johns, Yazdan Qafouri and Sario Solomon, collectively known as 5 to 5, winners of BBC's Let It Shine, who will play The Band, Rachel Lumberg as Rachel and Faye Christall as Young Rachel, will be Emily Joyce as Heather, Alison Fitzjohn as Claire, Jayne Mckenna as Zoe, Katy Clayton as Young Heather, Sarah Kate Howarth as Young Claire, Lauren Jacobs as Young Zoe, Rachelle Diedericks as Debbie, Martin Miller as Jeff and Andy Williams as Dave.